Top off your tree with this untraditional, but thoroughly charming tree hugger! 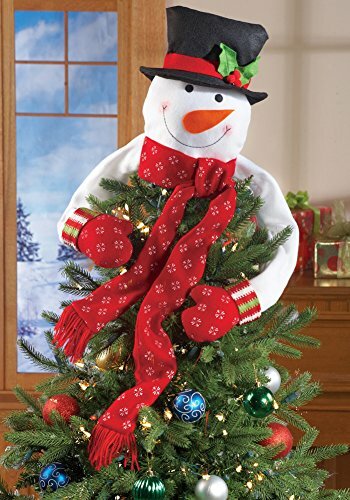 Cheerful snowman sits atop your tree and wraps his long arms around it in a festive hug. He wears bright red mittens with a cute snowflake pattern and a matching scarf that drapes down the front of your tree. Polyester and iron; imported. Snowman topper is 13"H, arms are 20"L and the scarf is 45"L.
He wears bright red mittens with a cute snowflake pattern and a matching scarf that drapes down the front of your tree. Snowman topper measures 13"H, Arms 20"L, Scarf 45"L.